Joël Boulvais, a colleague of mine on the Licence 3 English for Communications programme here at CELSA, recently drew my attention to an excellent article from The New Yorker about the birth of political consulting. 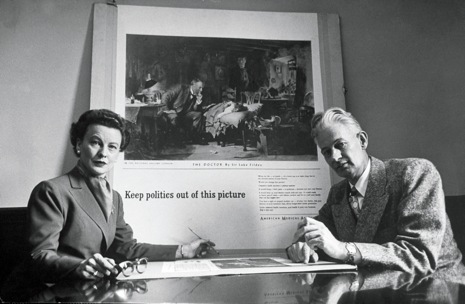 In 1933 (the same year that master of poitical communications, Adolf Hitler, became Chancellor of Germany) Leone Baxter and Clem Whitaker founded Campaigns, Inc. To quote the article, “… for years Whitaker and Baxter had no competition, which is one reason that, between 1933 and 1955, they won seventy out of seventy-five campaigns. The campaigns they chose to run, and the way they decided to run them, shaped the history of California, and of the country. Campaigns, Inc., is shaping American politics still.” (Emphasis mine). The article is not only a must-read for those studying communications — and not just political communications — but is a good example of the narrative journalism for which The New Yorker is so renowned. Did you know that a socialist once ran for office (albeit in the Democrat ticket) in California? Tags: Campaigns, Clem Whitaker, Leone Baxter, Political Communications, politics, Public Relations, The New Yorker, US politics. Bookmark the permalink.